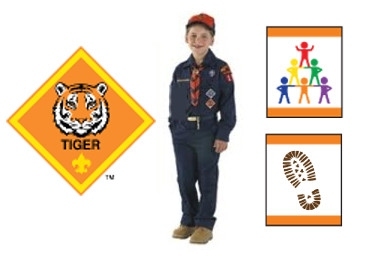 Summary Tiger Scouts is an exciting introduction to the scouting program for first graders ready to get going! Tigers do stuff - lots of stuff - and all with their adult partners. This program is intended to open up the world to inquisitive minds along with the caring guidance of adults. The first steps along the Boy Scout Trail are laid here and every rank advancement through the scouting program builds on the basic activities done as Tigers. If a child has completed kindergarten and has earned the Bobcat Badge, they may start earning the Tiger rank. 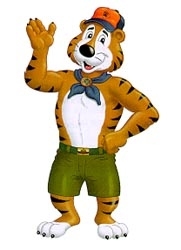 They use a Tiger Scout handbook. They will also need a blue Cub Scout Uniform. This part of the Boy Scout Trail is intended to take one school year, preparing the scout to begin their Wolf adventures after they complete first grade. Meetings are held on Monday at 7:00pm at Wedgewood United Methodist Church at 2350 Wedgewood Drive, Akron. Check the Pack Calendar and with the Den Leader for outing times and locations.